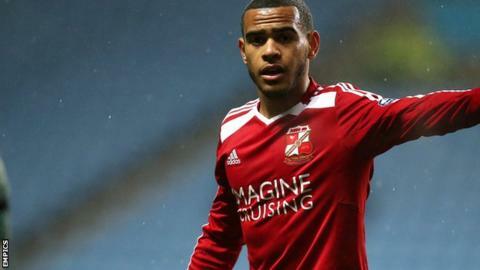 Swindon's injury crisis has deepened after on-loan midfielder Louis Thompson was ruled out with a knee injury. Thompson has returned to Norwich City after having a scan and is expected to be unavailable for the next two to three weeks. And Town boss Mark Cooper says it is an injury they have been monitoring over the last couple of weeks. Nathan Thompson, Jordan Turnbull, Jon Obika, Bradley Barry, Wes Thomas, Jordan Williams, Kevin Stewart, Fabien Robert and Yaser Kasim are all either suspended or injury doubts for Swindon, who are currently 19th in League One. "They are big players for us," said Cooper. Meanwhile, midfielder Jordan Stewart has returned to the County Ground, a fortnight after leaving the club because of homesickness. The Northern Ireland Under-21 international had returned to his home country after failing to settle in Wiltshire. "He's back," confirmed Cooper. "He's like a yo-yo, we had a bit of fun yesterday and a sweepstake among the boys on how long he would last this time. One or two days?"